Insidious: Chapter 2 represents what director James Wan has called his last horror film. Wan has consistently developed his craft with each new shocker (from Saw to Dead Silence to the first Insidious) and released his best yet, a satisfying haunted house yarn called The Conjuring, in summer 2013. But this continuation of his 2011 hit proves that the director’s ever-improving trend couldn’t last forever. 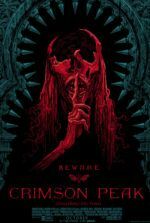 Wan’s unique ability to reinvigorate otherwise tired yet time-honored horror movie tropes has petered out here, in large part due to the uninvolving script by Leigh Whannell. The plodding, predictable story reduces all of Wan’s usually inspired technical frills into flat and obvious tricks of the trade. The tepid application of creaky old houses, spooky dolls, a haunted hospital, demented ghosts, unsurprising Boo! moments, underdeveloped characters, and cringe-inducing attempts at comic relief make Insidious: Chapter 2 seem more like a sophomore effort than what should be the best film yet from this promising filmmaker. 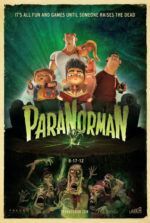 Picking up where its predecessor left off, the sequel once again centers on the Lambert family and finds the formerly possessed child Dalton (Ty Simkins) free of his spectral tormentor and back from “The Further”, a dark limbo inhabited by unruly spirits. 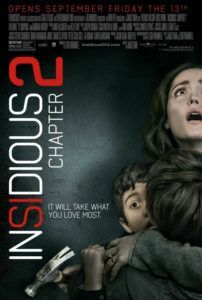 It’s here where Dalton’s dad, Josh (Patrick Wilson), is now trapped, his body invaded by a malicious ghost—a twist hinted upon in the final scene of Insidious in which someone, supposedly Josh, slays the medium Elise (Lin Shaye) responsible for guiding Dalton back. Now the family has moved in with Josh’s spiritualist mother, Lorraine (Barbara Hershey), and Josh’s wife Renai (Rose Byrne) suspects what the audience already knows: something is wrong with her husband. To answer the lingering questions of what happened the night Elise died, Lorraine heads the investigation along with Elise’s former colleague Carl (Steve Coulter) and comic-relief cohorts, the paranormal investigators Specs (Whannell) and Tucker (Angus Sampson). The investigation sends Lorraine and her crew wandering through a familiar series of sinister old buildings in the middle of the night, brushing away spider webs and turning their flashlights toward eerie sounds in the dark. It’s nothing you haven’t seen in an episode of Syfy’s Ghost Hunters or even the underseen Grave Encounters. Specs and Tucker record their findings on handheld cameras and for long stretches the film feels like a “found footage” movie comprised of unintelligible shaky-cam. Nothing ever comes of their footage. Meanwhile, Renai experiences all manner of disturbances at home (most of them concerning shrill, flashing baby toys), which leave her frantic and panicky. Byrne’s role has been reduced to screaming, crying, and running away from white-faced evil spirits—each assigned their own gruesome backstory involving a demented mother, her tortured child, and a cross-dressing killer. Before long, Whannell’s script takes us back into “The Further” to find the real Josh. But there’s something undeniably less thrilling about the search to find a grown man than the search to find a missing child, enough to render Chapter 2 almost devoid of conflict when compared to the first. At the same time, Evil Josh goes mad and chases Renai and the children around the house, except the possessed version of Josh isn’t quite as entertaining or pleasantly hammy as he could have been. While Whannell and Sampson deliver forced, unfunny moments of comic relief as the quirky ghostbusters auditioning for their own spinoff, Wilson isn’t given the opportunity to make his maniacal character memorable. He’s neither as scary as Linda Blair in The Exorcist nor as over-the-top as Jack Nicholson in The Shining; he’s just violent and angry, and the script leaves any insight into his possessor’s origins up to dull, overlong flashback sequences. Although the second “chapter” seems to end the Lambert family arc, its conclusion doesn’t prevent the filmmakers from offering yet another unnecessary cliffhanger ending that points to the inevitable Insidious: Chapter 3. However, we couldn’t be less interested in another sequel thanks to the extreme degree to which everyone involved here is on auto-pilot. Wan’s usual technical flair has few opportunities to shine; there’s not a memorable or impressive stylistic flourish in the entire film, only off-putting choices—such as the prologue where a young Elise, played by Lindsay Seim, is distractingly voiced by Shaye in some obvious audio looping. Reputable actors such as Wilson and Byrne appear to be going through the motions. The story doesn’t explain why Simkins has somehow aged two years overnight. A good film would have made these little details irrelevant and unnoticeable, but then Insidious: Chapter 2 is not a good film.